We have been searching for a good bone broth powder to carry in the store and have finally found one! We now have Jarrow Bone Broth Powder for sale in the store, in both beef and chicken varieties. Powdered bone broth is much more economical than buying bone broth liquid (which we do also have at the store), and still makes a delicious, steamy mug. Bone broth is an incredibly nutrient dense whole food. It is a natural source of type I and II collagen, which is amazing for skin and joint health. The collagen found in bone broth also contains natural forms of glucosamine, chondroitin, and hyaluronic acid- all nutrients which are well known for supporting the cartilage in our joints and helping arthritis-related joint pain. Interestingly, bone broth is also incredibly healing to the digestive tract, and is something that would be particularly helpful for people with Celiac or any other digestive issues. Drinking bone broth is very comforting to the intestines, and actually helps to supply the body with specific amino acids and other natural compounds which can help to heal and repair the intestinal lining (nutrients not easily found in sufficient quantities in other foods). I actually went to a seminar many years ago about natural ways to help people with Celiac, and the speaker recommended simmering a variety of bones and even chicken feet for days, saying that it made a broth which he said was, “The best thing for people with Celiac disease and other digestive issues” due to the types of collagen found in such a broth. I think most of us there thought that sounded a little weird, so it’s funny how that seemingly strange advice is now becoming so well known, and now we’re hearing more and more testimonials of people who have used bone broth with impressive results for their digestive problems. In addition to joint, skin, and digestive health, research has even shown that bone broth can help with boosting the immune system, something we could all use as the weather turns colder. 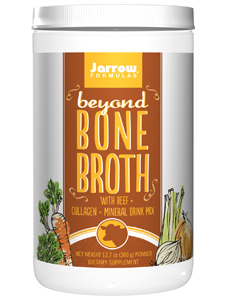 Jarrow’s bone broth is unique in that it also has additional natural calcium and silicon, two other nutrients crucial for bone health. The type of silicon in Jarrow’s bone broth has also been clinically shown to help with reducing wrinkle depth and improving skin elasticity. When choosing a bone broth, it’s important to use a brand you trust, since I’ve been reading more and more reports about how many bone broths on the market are not much different from regular beef or chicken broth. I trust Jarrow as a company (they make some of my favorite products) and love that they list the actual amounts of nutrients per serving (including the amounts of collagen) right on the label, so you know exactly what you’re getting. Bone broth powder is great mixed by itself with hot water in a mug, but it can even be added to soups or other foods for an added nutrient boost. One naturopath I read an article from recommended swapping a hot cup of bone broth for one’s afternoon coffee or tea- something I think is a great idea! Jarrow’s bone broth powder is available in both chicken and beef varieties and will be on sale for 25% off for the entire month of November.